This past weekend (February 14-17) was the Great Back Yard Bird Count (affectionately known as the GBBC). This is the weekend that birders of all skill levels go out to the neighborhood parks and back yards (or front yards) and count all the birds they see. These sightings are then entered into the vast database that is e-bird (whether you use the GBBC portal or not). As the e-bird reviewer for the Hudson-Mohawk Region of New York State, this is the most challenging weekend of the entire year. Don’t get me wrong, the GBBC is a great event. In fact I wish more clubs and organizations took advantage of it as way to work with new birders and encourage more people to go birding and how to share their sightings and information. But most people are left to their own devices, making (at times) wild guesses from field guides or via the internet, which is where I come in. Prior to the GBBC, I do try and take down any kind of rare or non-irruptive birds (in 2014, this means taking things like Common Redpoll and Pine Grosbeak off the checklists), the goal is the reduce the choices more casual birders have to enter. The hope being that if the species they think was sighted isn’t on the checklist that they might go back and take another look, maybe using some of the birds on the checklist as a starting point. It doesn’t seem to matter. I partially blame the phone apps, which if they are not connected to the internet, don’t flag things properly, not giving the user any warning that their sighting may be questioned. And a few people, clearly use the internet to ID birds, which results in birds native to Southeast Africa being reported in Albany, NY. Most of the ID mistakes are honest and rather easy. People always report Purple Finches, when most of what they are seeing are House Finches (there are a few Purple Finches). Many reports of Chipping and Field Sparrows are actually American Tree Sparrows. Carolina Wrens are often reported as Winter Wrens (a Wren in Winter, must be a Winter Wren). Downy and Hairy Woodpeckers are confused. American Goldfinches and Pine Warblers (!) are also confused. This means I spend much of the weekend not actually birding, but sending out e-mails, offering suggestions on what the correct ID is. 98% of those I respond to, are friendly and quite willing to chat with you about birds. Most are sort of embarrassed to have made the ID mistake (trust me, it’s not something to be embarrassed about!) and most happily make the changes to their checklists (reviewers can’t change any checklists). It is actually a pleasant experience for me and hopefully the user. But those 2% can be quite nasty. They leave a bad taste in my mouth, they make me not want to be a reviewer anymore. Being mean in responding to my inquiry doesn’t make your sighting more believable. I make it a point not to respond to these e-mails. I move on. But some of these e-mails are just vile. Thankfully, they are the exception and not the rule. I love the idea behind the GBBC. I also wish Cornell offered more resources to users (especially with common ID challenges) and encouraged more local organizations to assist in helping casual birders get this information out. But each year this event occurs, more of the kinks get worked out, more the user experience improves and more the reviewer experience improves as well! A few days ago a local birder on his way home from work, noticed 2 odd shapes next to a little patch of water along the north shore of the Mohawk River in Crescent, Saratoga County. The birds were just within the lights of a local Tavern and in this dim light, he could make out that they were 2 Sandhill Cranes! Sandhill Crane is a bit of a enigma in Region 8, it occurs in the area annually, but its totally random as to where they might show up. 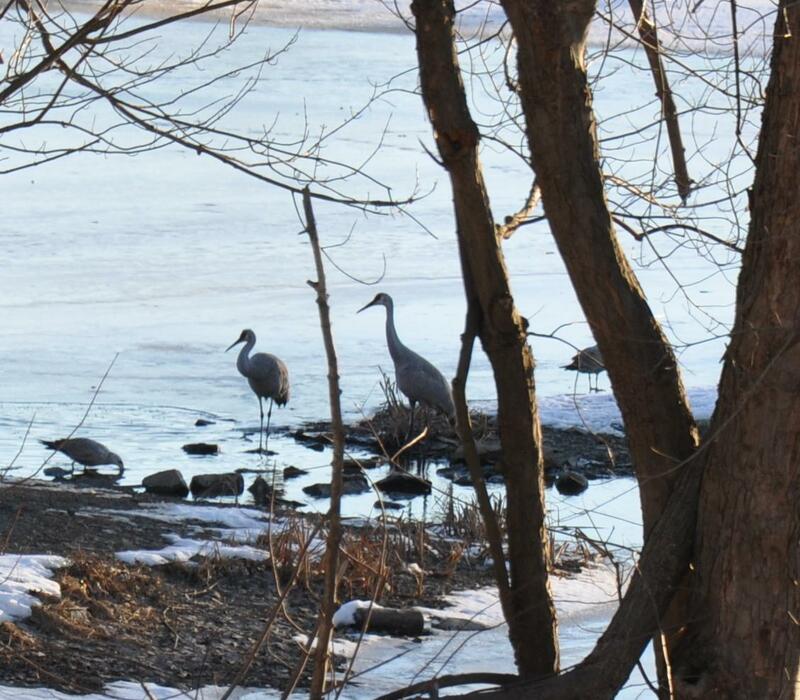 In e-bird (where I am the local reviewer), there had been 2 Sandhill Cranes present in western Saratoga County on and off for much of the latter part of 2012. Perhaps the same birds? The next morning a few birders still found the Cranes at first light and they hung around for about an hour after sunrise before taking off west over I-87 and Twin Bridges. Another birder stopped back at the area around 5pm that night and again found the Cranes in the spot they had been reported next to the tavern. The next day more birders showed up, but the Cranes took off right after sunrise (and just as I was leaving the house! ), but once again the came back late in the afternoon to the same spot. This morning, I made another attempt after getting the kids on the bus. At 7:30 am I got an e-mail saying the birds were still present, so both Danika and I were hopeful. We finally got to the spot around 8:30 am and found quite a few birders there (The Thursday Morning Group) and sure enough, there were the 2 Cranes in the little patch of water next to the tavern. We enjoyed the Cranes for about 30 minutes, even getting a cruddy, but at least recognizable picture. 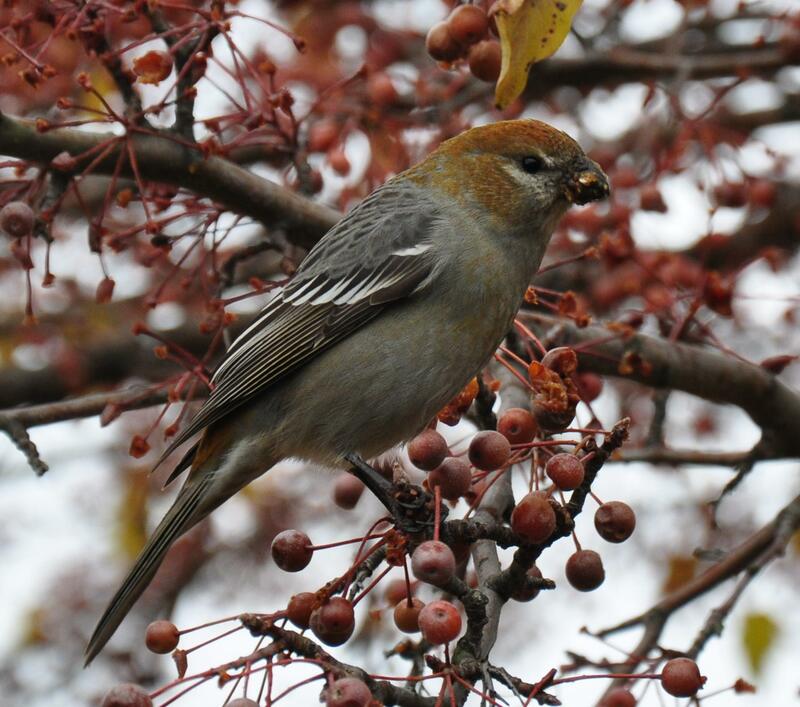 After seeing the Cranes, we hopped on the Northway and headed up to Queensbury, Warren County where Pine Grosbeak has spent much of the winter. The original areas I had seen them with Corey Finger back in December were all eaten and it took us sometime of wandering through various housing developments looking for Crab apples Finally, we had a flock of about a dozen birds fly over us in one development (year bird # 2 for the day), not the best looks (especially for Danika who has not seen them in a couple of years), but clearly countable and identifiable. After getting the Grosbeaks, we headed over to Ft. Edward, Washington County, but it was very quiet. There were a few good looking Rough-Legged Hawks and many, many Red-tailed Hawks, a small flock of about 25 Snow Buntings and a lone American Kestrel (year bird # 3 of the day). Our last stop was at Wrights Loop in Saratoga County, where I hoped to pick up an Eastern Screech Owl that tends to roost in a Wood Duck box there, but no luck, though although we did find a Northern Flicker, the 4th new year bird of the day. So the first chase of 2013 was a success, 4 new year birds bringing me up to a nice 58 through the 1st 10 days of January! And getting Sandhill Crane was nice, it was on my “possible” list, so always nice to be able to cross one of those off! Eastern Screech Owls are fairly common here in Eastern New York, they can be found in most lower elevation areas, especially away from the deeper forests (and Great Horned Owls!). They are particularly at home in suburban yards and even venture into the City of Albany at times. More often that not I find these birds in winter in empty Wood Duck boxes, which also double as nice roost box for an owl. Whenever I see a Wood Duck box, I check them out to see if there is a “fluff” ball looking back at me. Danika has been working part time at a farm/butcher shop in Alcove, southern Albany County. This morning on her way home, see noticed a reddish pile of feathers in the road and pulled over to check it out. 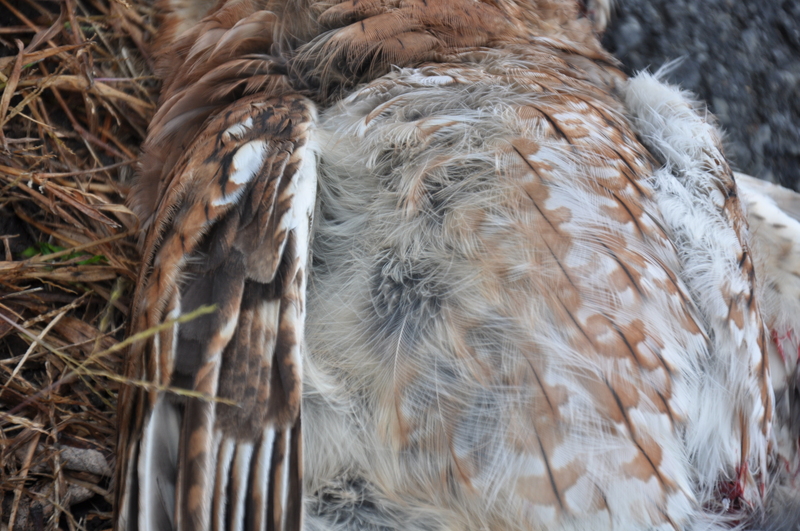 She was sadden to find it to have been a red phased Eastern Screech Owl. Most of the bird was largely intact and undamaged but it appeared the bird had flown head on into a car, as its face was smashed beyond recognition. 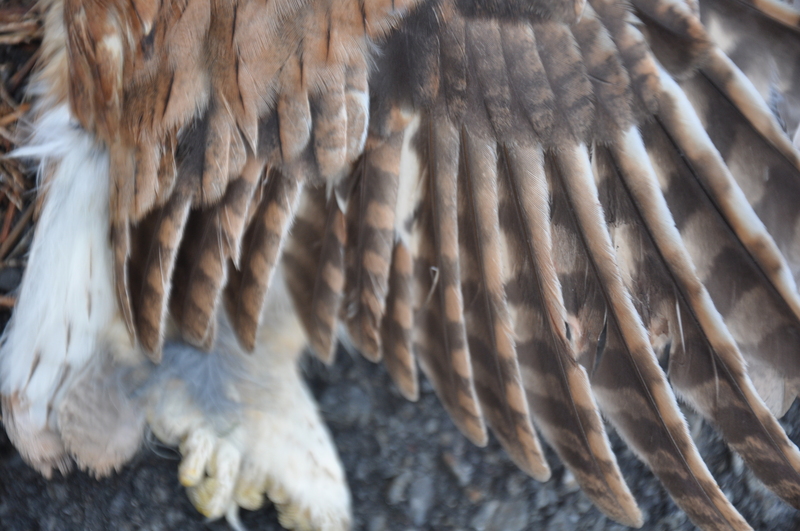 Not wanting to miss an opportunity to check out these little guys close up, she took a few photos and then picked up the owl and placed it to rest in the woods, where it won’t get repeatedly run over by cars. 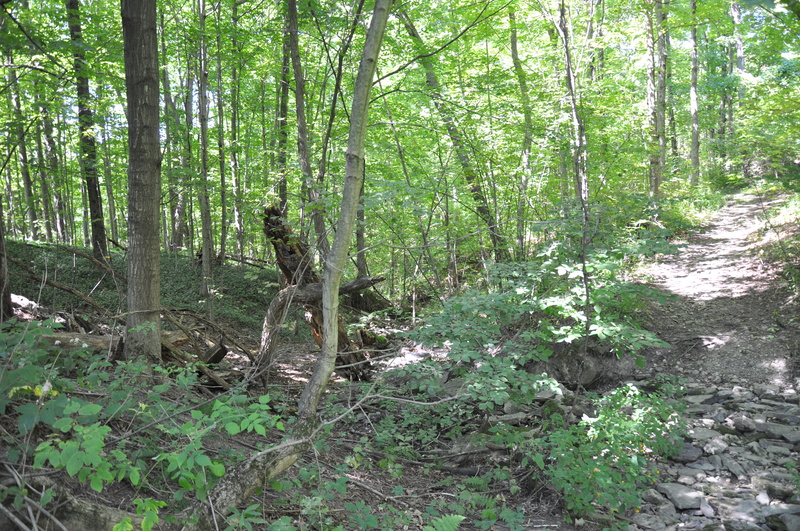 This is from a walk I took a couple of weeks ago, birding was very slow, but this is one of my favorite places to bird, not always because it has great birds (its a known Hooded and Worm-eating Warbler location), but that its just a neat spot. 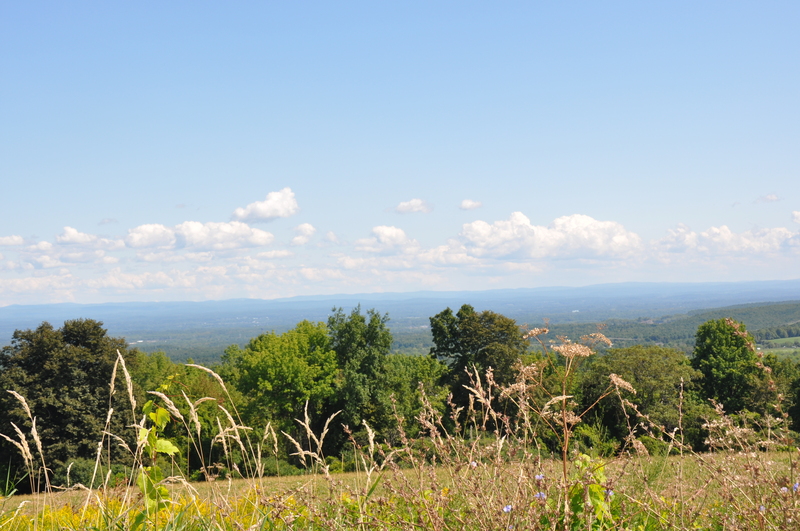 A view towards Albany from the Upper Holt Preserve, Coeymans, New York. September 2012 – by William Raup. So far the last few nights, I’ve spent my evenings in the backyard looking for Common Nighthawks. Usually in late August I’ll see dozens of these graceful Nightjars flying over my house as they make their way south for the winter. This year I appear not to be on the flight path as I have seen none. Zip. Zilch. Nada. Thankfully some other birders have set up shop the last few nights near the Albany Pine Bush and have reported at least healthy numbers each night. So they are out there, just not over my house. Right at dusk last night, I was scanning the western sky for Nighthawks, when a fairly large Warbler practically dropped out of the sky into the weedy and brush margins of my yard. Thinking I had my first Common Yellowthroat of the fall, I was very surprised to see a much larger warbler, with evidence of a hood, along with a strong white eye ring. 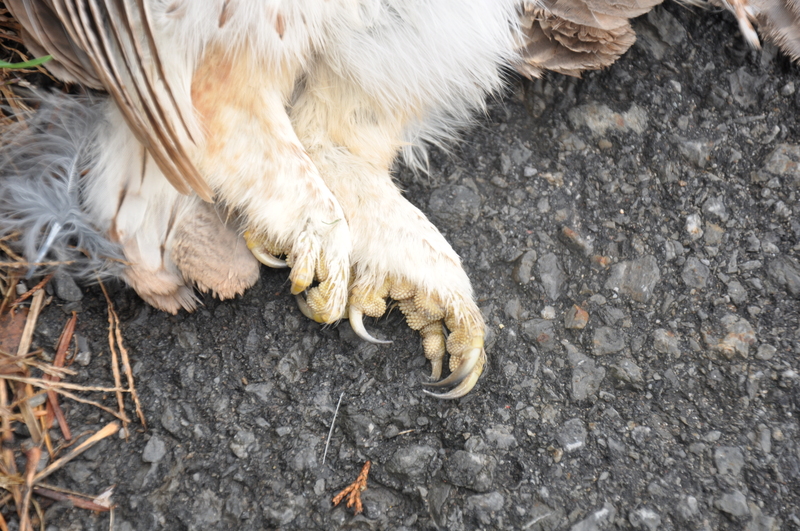 The bird was also a skulker, keeping very low in the vegitation or directly on the ground (and out of sight). Given its size and coloration, I reported it as a Mourning Warbler, even though that eye ring would be very unsuaul (but not unheard of). It was too big for most other warblers, and the bold eye ring ruled out the rest. However it was dark and I just went with what I saw. During the night my ID bugged me. By morning I had turned the bird into a pale Canada Warbler. But it still didn’t sit well. A “Mystery” Warbler. August 23, 2012 – Albany, NY – Will Raup. Clearly my ID of a Mourning Warbler was off. Even Canada Warbler was being a stretch. Only 2 birds really fit this description, one the rather common Nashville Warbler and the decidedly uncommon Connecticut Warbler. Now I have seen many Nashville Warblers, especially in my backyard… and this warbler was too big. Also the bill and tail were very long for a Nashville Warbler. 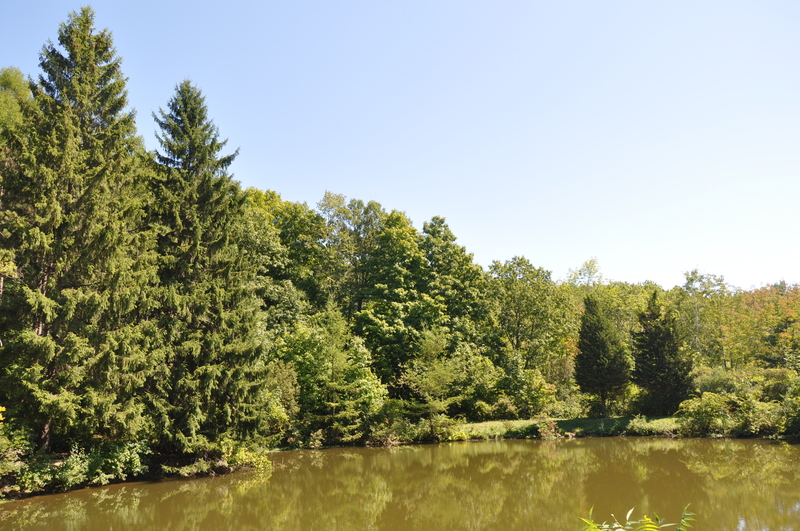 But a Connecticut Warbler is almost unheard of in this part of New York, even more so in August. So I needed a fresh set of eyes. I set Danika up with the photos and field guides and she kept coming back to Connecticut Warbler as well. As this would be a life, and one heck of a yard bird… it gnawed on me. So I posted the pictures on facebook, in particular the American Birding Association page. I then had to mow the lawn. While I mowed the lawn (figuring if the bird was still around this would get rid of it), I went over all the field marks in my head. Everything was pointing to Connecticut Warbler, but since I had zero experience with this species, I was being cautious. Later in the afternoon, I started to get some feedback. 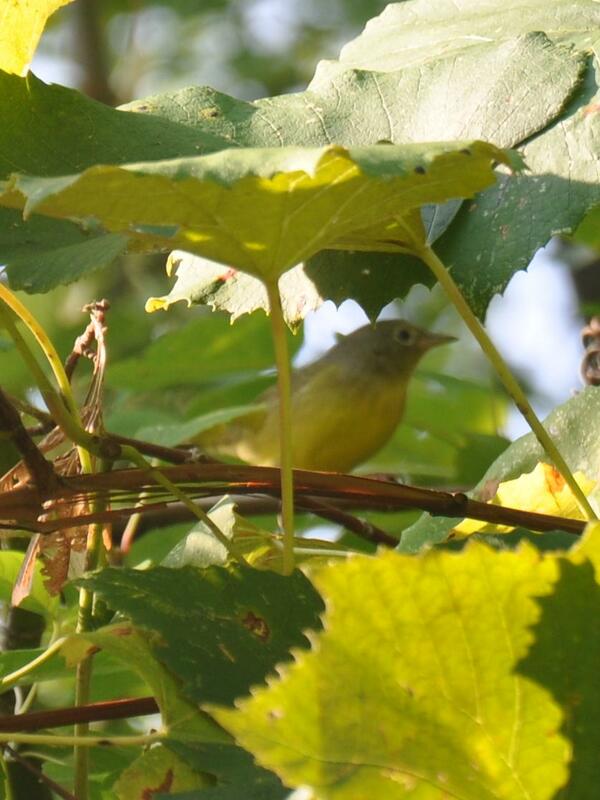 Some still called it a Nashville, a few a Canada and soon there was a number of people supporting Connecticut Warbler. When Ken Kaufman posted his thoughts that it was a Connecticut, things really started falling into place. So I was feeling pretty good, as I headed out for another Nighthawk vigil this evening. Again, no Nighthawks… but right at dark, against all odds, the bird reappeared. This time I was able to (quickly!) see the long bill and tail and large size, clearly ruling out Nashville. The white eye-ring looked like a flashlight in the dark, dense Golden Rod. The bird only made a couple of brief hops up to about 3 feet off the ground, but spent much of its time right on the ground, decidedly not Nashville behavior. Mystery Solved a new life and yard bird!